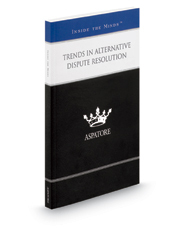 Trends in Alternative Dispute Resolution provides an authoritative, insider's perspective on engaging in different types of resolution and achieving the best possible outcome for the client. Experienced partners from law firms across the nation guide the reader through the process of recognizing appropriate resolution methods and helping clients understand their varied results. These top lawyers offer specific advice on selecting an appropriate arbitrator for proceedings and understanding the advantages and disadvantages of choosing ADR to settle a dispute. From discovery and finality to efficiency and confidentiality, these experts discuss the key steps involved in accepting various settlements and stress the importance of early case evaluation. The different niches represented and the breadth of perspectives presented enable readers to get inside some of the great legal minds of today, as these experienced lawyers offer up their thoughts on the keys to success within this increasingly popular field.